Apparently my pancreas is still making insulin. I’ve had Type 1 diabetes (T1D) for almost seven years now. And the first five were pretty easy to manage, minus the extreme lows. I maintained an average A1C (average blood sugar levels over a three-month time span) of 5.5. To put that in perspective, when I was admitted to the hospital upon my initial diagnosis, I had a blood sugar level of 690 (normal blood sugar levels range from 88-120) and an A1C of 16.0. So yeah 5.5 was quite a difference. But it also meant I was having a lot of low blood sugar levels. I also had two seizures as a result of hypoglycemia (severe low blood sugar) in that five-year time span. I adjusted my basal (base amount of insulin administered over a 24-hour period) and bolus (amount of insulin I take for food) rates. 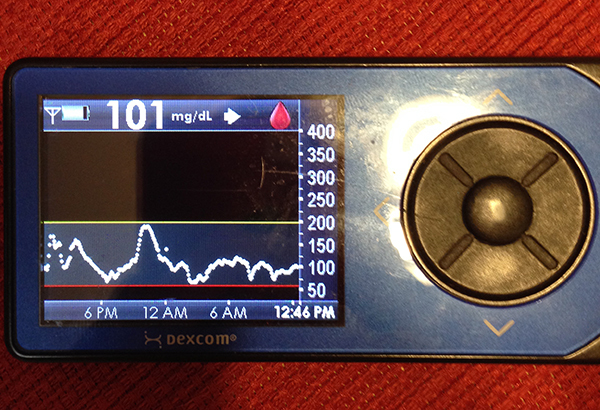 I got an insulin pump and a CGM (continuous glucose monitoring system), which basically measures my blood sugar 24/7). So if my body was still producing insulin, and I was injecting external insulin, then it makes sense I might have a lot of unexpected lows. It also makes sense why it was so easy to manage. I was very sensitive to insulin. And over the past two years, that sensitivity has gradually decreased. My blood sugar levels spike for no reason. My basal and bolus rates constantly fluctuate. My A1C levels have gone from 5.5 to 6.3. I keep wondering what I’m doing wrong. An A1C of 6.3 is not bad. But how did an A1C of 5.5 seem so easy to achieve and now anything below 6.0 seems impossible? No wonder other diabetics asked what was my trick? How could I achieve such a low A1C? About a month ago, I had some annual lab work done and then went to visit my endocrinologist for my regular three-month check-up. Because I was diagnosed later in life (at 22) and had no family history of the disease, she wanted to check my C-peptide (generally linked to insulin when first made by the pancreas) levels and double check that my diagnosis of Type 1 diabetes was correct. She didn’t doubt it but was just curious. All new doctors are. And I usually sigh. Because even though they don’t mean to, they give me false hope. I still wonder if one day they’re going to come back and tell me I actually don’t have Type 1 diabetes, that there is a cure for whatever is wrong with me, and I no longer have to inject myself with insulin and check my blood sugar multiple times a day. That hope has dwindled over time. And when I sat in the examination chair at my doctor’s office, I expected the usual results. I was surprised my A1C had climbed from 6.0 to 6.3 in three months, but knew I was having more highs lately than lows. What I wasn’t expecting was that my body was still making insulin. “It’s not much so you still need external insulin to function, but I’m surprised after six years it’s still making anything at all,” the nurse practitioner told me. In fact, most Type 1’s lose any ability to produce insulin within the first three years of having the disease. “Maybe it’s because you were diagnosed later in life? But I would guess within a year you will no longer be producing any insulin,” she said. I vaguely remembered after my diagnosis that my doctor told me my body was still producing some insulin but that would probably cease within a year. Six, almost seven years later, it’s still functioning, albeit abnormally. My 22-year-old self might gain some hope. What does this mean? Does this mean my body is returning to normal, that I may one day function correctly again? But my 28-year-old self does not question my diagnosis. Instead, I relax my shoulders and let out a long breath. The reason my diabetes has become harder to control and manage is not because I’m doing something wrong or I have become worse at it – no, it’s because my body is producing less insulin and therefore I am less sensitive to it. My body is no longer helping me the way it was. And over time it’s going to get tougher. So I may have to be stricter about my diet and reduce the amount of sugars and carbs I sometimes indulge in? Maybe I can no longer have that pint of gelato during the summer? Maybe I can just have the serving size of half a cup or none at all? Maybe I can no longer eat crackers with my hummus and instead revert to carrots or peppers? Maybe I can no longer eat toast or oatmeal for breakfast and must focus on low-carb alternatives like eggs? Maybe but I’m sure I’ll figure that out over time. It’s just nice to know that I’m not the root cause of my climbing A1C. I’m used to managing this disease with a little help from my pancreas, and over time that pancreas is giving up. Now I must learn how to manage T1D on my own. So what’s up with these unexpected no-hitters? Over the past week, I was staying at my parents’ house, consuming all kinds of carbs and sugars. I usually let myself cheat during the holidays and anticipate the high blood sugar levels. I just take more insulin and exercise to keep it steady. But this past week hasn’t been hard like last year or the previous years. In fact, it’s been incredibly easy. I’ve been taking insulin over a specific amount of time to account for the slow digestion or delayed spikes. And yet, for the most part, my blood sugar has stayed within the lines. So what’s my technique? How did I manage to survive the holidays aka Cookietown with stable blood sugar levels? Sometimes all we need is a little help from a friend.